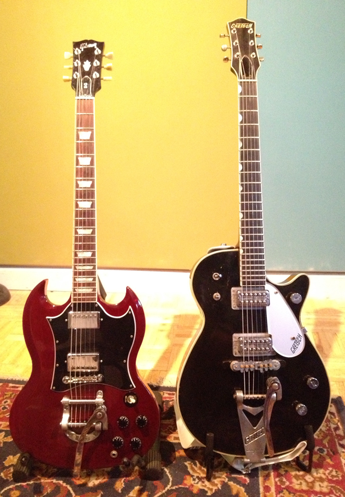 Artists that have worked with me know that I especially LOVE recording electric guitars and drums. In some of these situations, I often get an adrenaline rush when I match up the right sound with the right performer. I love watching a guitar player connect with their sound, when a chord is struck with just that little extra bit of “pounce” in visceral reaction to what is coming out of the speakers. Once a player experiences this “for real”, a connection is formed…for life. The same thing applies to drummers too…especially regarding snare drums. 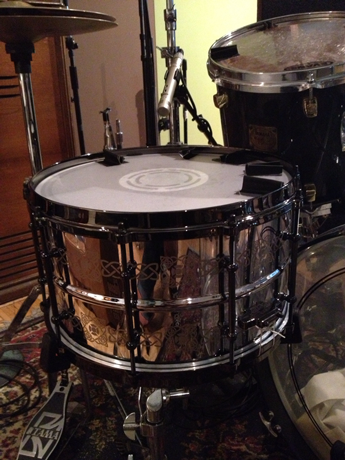 I can often feel grooves change with the swapping out of snare drums. It’s also to interesting to notice how a player changes the way that they physically hit the drum based on how it’s tuned. A particular drum can actually foster a particular drum beat…human beings react to these things, and that’s a big part of why I enjoy being involved in the creation of these sounds. This past week we put together a great collection of musicians to help us re-create the sound of AC/DC. Sonically, I took my cue from the iconic, chart-busting album from 1981…”Back In Black”. The instrumentation is simple – Just two guitars, bass, drums and vocal. You might think that this would make re-creating it simple too, but the reality is that with no rhythm guitar layering, there is nothing to hide behind…just the Young brothers panned off in their respective speakers (Angus on the right, Malcom on the left). You can clearly hear two distinct players, not only reacting to the sounds that have become synonymous with them as players, but also reacting to each other. 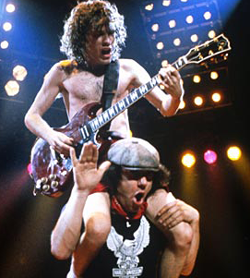 Do yourself a favor…put on an AC/DC song and listen with that in mind…it’s powerful. There is so much life in those performances, and it’s also where much of the groove is coming from. Combine this with drummer – Phil Rudd’s “lay down the law” style of drumming, and you get something really special. Technical stuff aside, I knew that the only way I was going to pull off a convincing AC/DC sound was with the right players and so I enlisted Chris Cote (Malcolm guitar) and Jim Janota (Drums) from the band “The Upper Crust” as well as Seager Tennis from the band “Mellow Bravo” (bass), and my brother David to play the “Angus Guitar”. As usual, Aaron Perrino brought in the perfect song to help showcase these sounds…the lyrics literally had us in hysterics…not because they were unlike something that AC/DC might write, rather the fact that they were unlike ANYTHING we thought Aaron ever would. He had also expressed to me that he felt the vocal approach was going to be a challenge for him (in the days prior to recording) as it was a little bit out of his comfort zone stylistically. I’ve personally heard Aaron sing everything from operatic style to screaming at the top of his lungs, and my only concern was that we didn’t go too much in the way of parody. We needed to embr ace the rocking spirit of the track and deliver the right balance of AC/DC and Aaron Perrino. I feel like we found a nice middle ground. I actually get the same rush from Aaron’s chorus vocal delivery as I do from a Sheila Divine song like “Hum” or “Like A “Criminal” and the verses are delivered much in the spirit of Brian Johnson or Bon Scott. So with all of this good stuff working for me, I was left with the task of getting the right sounds. 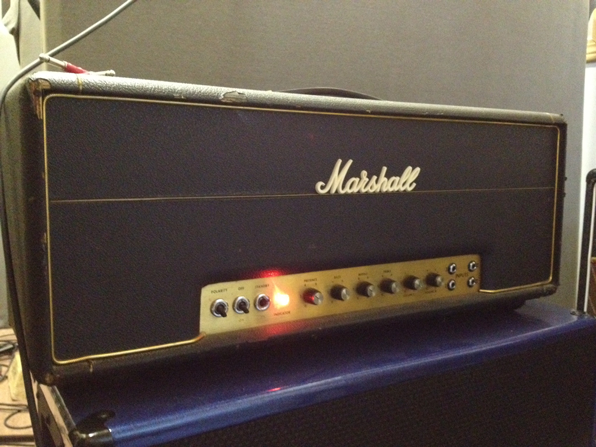 For the “Angus” guitar, we used a Gibson SG plugged straight into a 1971 – 100 watt Marshall Super Lead amp head. The cabinet we used was a custom closed-back cab loaded with Celestian G12-75 speakers made locally by Rob Lohr of Allston amps. 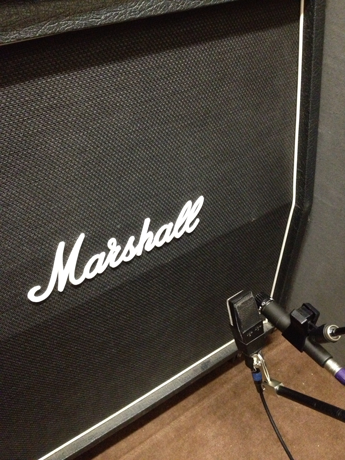 Although it’s a 2X12 cabinet, it is voiced to sound like a 4X12 when close-mic’d…a great space saver. For the “Malcolm” guitar we used a 1959 (original) Gretsch Duo Jet guitar plugged straight into (no pedals) a Marshall JVM 410 100watt head and Marshall 1960A 4X12 cabinet also loaded with G12-75 speakers. We close mic’d both cabs with an AKG C414 and Shure SM 57 (see pic) into the Neotek Elite console mic pres with no compression and some deliberate EQ. It’s documented that either Neumann U87 and/or U67 mics were used during the actual guitar recording of “Back in Black”. Both mics have more of a musical midrange bump than a 414, but my EQ settings seemed to make up the difference. Using no compression was key to letting the players dynamics translate to the recording. The bass was a 1972 Fender Precision plugged into an Ampeg V4B and 8X8 cabinet. We mic’d it with an EV RE-20 dynamic microphone and took a direct signal (D.I.) too. (AC/DC) originally used an AKG D12 with a D.I. as well. 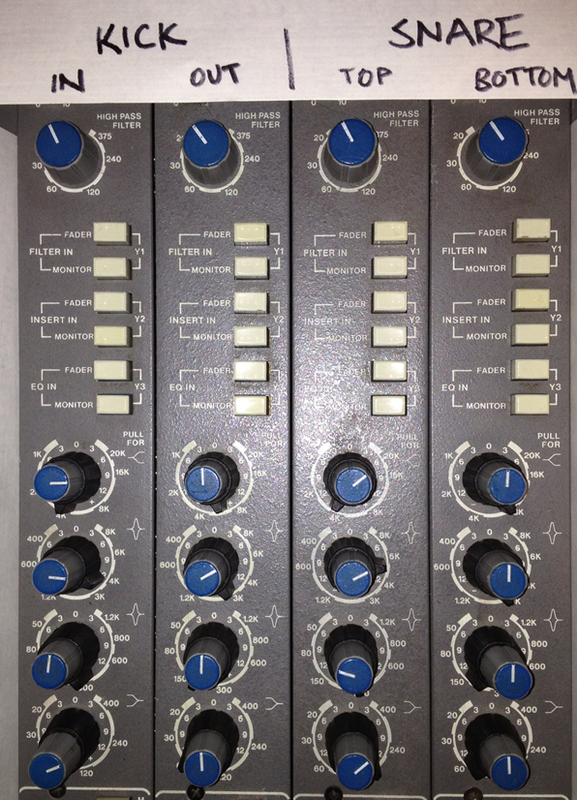 The mic pre we used is a Chandler Limited EMI TG-Channel MKII…I used the EQ to match up what I was hearing on B.I.B. and went into a 50’s Collins 26U tube limiter. Seager is a very consistent, driving bass player, and a slow limiter worked well to help maintain an even presence of bass without much “pumping”. The drum sound is something that I thought a lot about all week leading up to type recording. The snare drum was particularly concerning. These days Phil Rudd uses a Sonor signature snare drum that is 5 1/2 inches deep, the drum I was hearing on B.I.B. sounded way deeper than that to me, and I decided to go on a snare drum hunting mission of my own. I went to Dicenso’s Drum shop in S.Weymouth, Ma. and began testing out some hopeful candidates. My past training as a drum technician seems to pay off regularly. After tuning and retuning, narrowing things down, swapping out drum heads etc…I made my choice; a Ludwig 8 inch deep “Black Magic” series drum outfitted with an Evans EC – reverse-dot frosted drumhead. I found an interview with Tony Platt (engineer for B.I.B.) where he revealed the mics that he used for the album. I used this as a guideline, but the choices that made the biggest impact were using a small diaphragm condenser on the snare top (Neumann KM 86) and a SM57 underneath. I usually do the opposite (use a condenser underneath and dynamic on top). Check out the pics of the console eq settings for the kick and snare mics. During the mixing process, I did some relatively crazy things to perfect the B.I.B. snare sound including, bussing the signal off to an Eventide H3000 and pitch shifting (and slightly delaying) the signal (-300cents). I also, split the snare off to a Collins 212Y tube preamp and distorted it pretty good and mixed that in underneath the fundamental snare signal. Lastly, I used a slight bit of digital reverb…again from an Eventide H3000. I used the “Reverb Factory” patch and made a 1.2sec reverb patch with 20ms of predelay. I eq’d the reverb return (boosting 6kHz) to match what I was hearing on the song “Back In Black”. Before landing on this, I tried separate delays as well as real plate reverb, and the Eventide just sounded “right”. I also had Jim Janota (drummer) play along with AC/DC’s original recording of B.I.B…this allowed me to tweak the eq and effects while toggling between the reference track and Jim’s playing. All in all, a bit of a roundabout way to get there, but it worked. Check out the video shot by Jim Gilbert and edited by Will Claflin (a.k.a. Sacruhlicious) and feel free to download the audio track for free as well…Enjoy! Tuesday Night Recording Club – “I Want My Rock And Roll” from Tuesday Night Recording Club on Vimeo.